Politics pervades every link in the food chain from the farm to the fork. It influences what foods we eat, how much they cost, what we know about them, and how safe they are. This book brings the point home by focusing on the vexing issue of dietary fat content - known to be a health menace but also an ingredient in many or most of our best-loved foods. Through this prism, Dr. Sims explores the politics of food assistance programmes (with a case study of the National School Lunch programme); agricultural policy (for example, the price premium paid to farmers for milk with high butterfat content); food content (with case studies of food labelling and the approval process for fat substitutes); and dietary change (with a case study of nutrition education programmes). The book concludes with consideration of the costs and benefits of government intervention and nonintervention in food policy from the supply side to the demand side and its consequences for human health (and happiness). 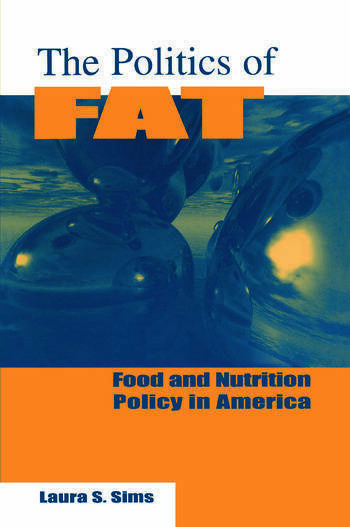 "The Politics of Fat" shows how government policy affects not only breakfast, lunch and dinner, but also our between-meal snacks; explores the nexus of health policy and agricultural policy from price supports to trade policy; and is written in an accessible style enlivened by discussion-provoking case studies.